Iowa in June – lush, green, gardens already producing basil, garlic and a beautiful array of colorful flowers. On the down side – the rivers are overflowing and flooding is a real possibility. The evening we arrived, our son-in-law and daughter prepared a wonderful meal of ground lamb nachos with mint sauce. Before we ate, however, Jonathan got busy inventing a new cocktail that he aptly named “Prohibition.” He didn’t write down the quantities or method but I eyeballed his preparation and have a close recipe below. The tastes are very complex – not too sweet and not too boozy. Just how I like ‘em. About the rye: this is produced in Iowa and according to Rachel, it was made in small batches until very recently when it hit the big time. Today, Costco in Iowa sells Templeton Rye and it is also available online. I found their website fascinating and highly recommend all you history buffs and foodies check it out! This is the first time I have ever tasted rye whiskey and I found that drinking it straight out of the bottle was a bit overwhelming but I loved it in this cocktail! I’ll be bringing a couple of bottles of this stuff back to Seattle. Chill two martini glasses in the freezer for about a half hour, then rub the rims of the glasses inside and out (about ¼ inch down) with lemon juice; dip each glass rim into a cinnamon/sugar mixture. The glasses can be kept in the freezer if you aren’t ready to pour the cocktail soon! Zest lemon with a zester that allows you to create long, thin strips of peel (my favorite kind is similar to the one pictured here). Drape the peel over your martini glass so some hangs inside the drink to impart the lemon oil. Heat the honey and lemon juice in the microwave for about 10 seconds and then place into a cocktail shaker with the rye. Fill to two inches below the brim with ice. Shake for about 30 seconds, make a lot of important sounding racket then pour (strain if the shaker doesn’t already have a strainer) into your chilled martini glasses. Jonathan tried to dissect the beverage, but like I told him, don’t add bitters, don’t add more or less honey, don’t add or delete a thing! In other words, it is perfect as is! 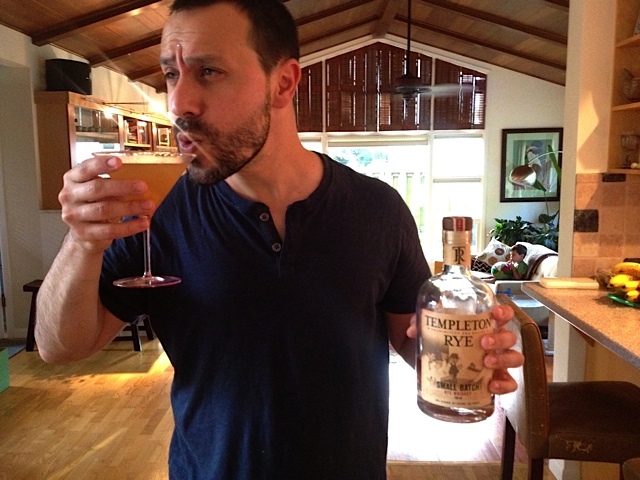 This entry was posted in Beverage and tagged Templeton Rye. Bookmark the permalink. I’m sorry, but Templeton Rye is not made in Iowa, simply marketed as if it was. You are correct–I did further research and it is bottled in Iowa. They sure lead you to believe otherwise with packaging etc! Thanks for catching my error.